HOME -> Consumer Marketing -> Acquisition -> Why Didn’t Adidas Learn from Past Gaffes? Why Didn’t Adidas Learn from Past Gaffes? What is it that marketers don’t get? You don’t have to look far to find all kinds of recent blunders by marketers, some more egregious than others. These blunders are the stuff of marketers’ nightmares. So why do they keep happening? Of late, we all know that Pepsi sent Kendall Jenner out to participate in a tone deaf ad that got thrashed on social media and pulled by the brand within hours of airing. Advertisers on YouTube fled in droves after it was discovered that it wasn’t paying attention and posted unsavory and downright despicable videos next to advertisements by some of the world’s largest brands. And people are still talking about the Texas mattress company that aired a “9/11 Sale” video showing two store workers collapsing into and smashing down two towers of mattresses and joking about that terrible day. The owner had to lock the doors. So why is it that Adidas is now under fire after doing something so insensitive that it is truly incomprehensible. It sent out an email to Boston Marathon finishers that read, “Congratulations, you survived the Boston Marathon.” This arrived in inboxes a mere five years after the Boston Marathon terrorist attacks that killed three and injured hundreds. Who is sitting in these creative brainstorming sessions when something like that gets green-lighted? Brands have been taken down by explosions of social media hatred for much less egregious blunders than this. 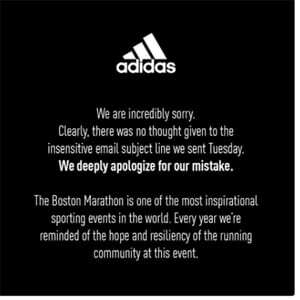 Like all the other brands before it that found themselves in similar situations, adidas quickly apologized. But, of course, it’s too late. The damage is done. As history has shown us, adidas may not have to be in the spotlight for too long before another marketer stumbles.